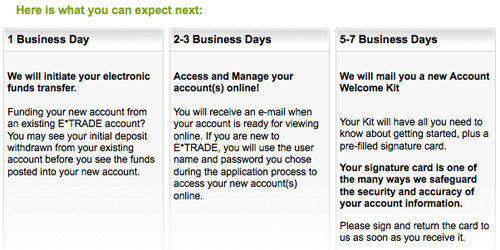 As part of my continuing quest to find the best online savings account, I opened an account with E*Trade last night. In case you’re not familiar with E*Trade, they’re not only one of the best online discount brokers, but they also offer a full complement of banking services. This includes a high yield savings account with no minimum balance requirement, and no fees. The signup process was very simple and straightforward. In the first couple of screens, they ask for all of the standard info: name, social security number, address, phone number, and driver’s license number. If you’re setting up a joint account, you’ll also need to enter this information for the joint account holder. After that, you need to choose your account type. 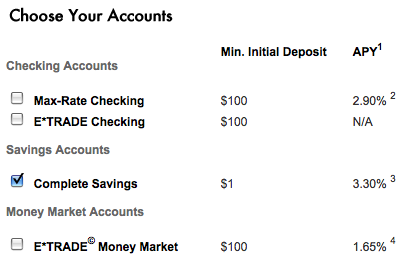 As you can see, we opted for the “Complete Savings” account, which is currently paying 3.30% APY. They also offer the opportunity to buy CDs of varying lengths, but the rates weren’t particularly compelling. Next up, funding the account… I opted to fund it online, so I had to enter a bit of banking information. Note that you can do it via wire transfer or by sending in a check if you prefer. Interestingly, they don’t make trial deposits for account verification. Rather, they just pull the funds directly out of your account. That being said, they limit your initial transfer from an unknown account to a maximum of $100, which is presumably designed to minimize their liability. As you can see below, they should initiate the transfer within one business day. We’ve received your application and will begin processing it immediately. As soon as all of your information is verified, we will open your account. You will then receive an email when your account is opened and visible online. In the next business day, we will be also be initiating an electronic transfer totaling $1.00 to fund your account(s). In some instances, you may see funds going out of your existing account prior to depositing in your new account. Until then, if you have any questions or need more information please call us at 1-800-ETRADE-1 (1-800-387-2331) from 7 a.m. to midnight ET, send a secure email to [email protected], or visit an E*TRADE branch near you. Visit etrade.com/centers for a listing of locations near you. We appreciate your business and look forward to serving your financial needs for many years to come. And now, we wait… Our account should be up and running within a few days, and I’ll be sure to update when as things develop. I believe I made a mistake in opening a brokerage account with Etrade. If you’re a smaller investor, like me, I don’t reccommend them. Their fees are too high. The 3.3% advertised here is no longer available, I believe it’s under 2% now. What really bugs me are the brokerage fees, though. The $7-$10 trades they advertise are bologna, unless you have at least 50k in your account, and unfortunately, I don’t. The fee for me is $13–if you’re trading in relatively small amounts, and have to make at least $26 for every transaction, it’s absolutely not worth it. And, if you don’t make trades, you’re charged $40 a quarter–obscene, imho. For what it’s worth I used to highly recommend E*Trade, that was until last month… I was 10 days into my honeymoon in Hawaii when my ATM card stopped working. I called the 1-800 number and found it that they were unable to help, I needed to call the account security office or something like that. So I called them. No surprise, they were closed, since I was in Hawaii and they work 9-5 eastern time M-F. So I left my name and number for them to call me back on their answering service. Since it was Saturday I was stuck. I used my brick and mortar bank ATM card and paid the fee, getting enough cash to last me the remaining 4 days of honeymoon. They never called me back. Back on the mainland, I called and waited on hold for 30 minutes, then I talked to some idiot that wanted to verify where I logged onto my account from. 15 minutes later he finally figured out that ncr.com was Quicken… Grrr. “Sorry for the inconvenience.” I do have to say E-Trade is great, until you hit one of their snags. Google “ETrade account frozen” for more horror stories even worse than mine. pluto: Yes, but for liquid assets, you can’t do too much better, and you could do a lot worse. I just opened one of these accounts myself. The funds appear in your account in about 2 days — but they will remain unavailable until they receive your signature card. And you have to wait for it in the mail and mail it back in. As for the verification, they only let you transfer in up to $100 from an unverified account to set up your new E*Trade account. Once the account is open, you can verify your newly linked account online (for some banks) or by the good old 2 small charges method (they DO NOT take back the tiny deposits afterward like some places). Otherwise you can’t use it for additional deposits. You can’t activate ACH transfer out to a linked account until your signature card has been received (just like you can’t make any other withdrawals). So basically, you can’t use the account for the first week and a half-ish. But I’m still very happy with them. And I love their online banking interface. The savings account is NOT eligible for online bill-pay, but you can open up a free (no minimum, no interest) or MaxRate (minimum for no fee, decent interest) checking account if you want to use that feature. Same process has to be gone through for the checking account — wait for signature card, etc. Now if only Sharebuilder wouldn’t being such a pain in the a** about transferring over my Roth IRA! I found it interesting when you said they don’t do trial deposits. My husband (then fiance) and I opened a joint complete savings account in January 2008, and I know there were trial deposits. In fact, I added another linked account in the summer time, and had trial deposits entered then as well. Wonder if this is a new thing, or maybe it’s just a later step once they set the account up with your initial deposit? I’m curious to find out.